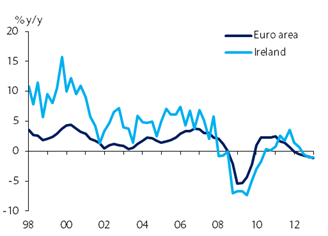 Ireland was the one country in the Eurozone "periphery" that seemed to be bucking the trend (see post). Many had hoped that the nation will be able to withstand the Eurozone recession due to its strong trade balance. Exports were really humming until global growth stalled last year (see post). 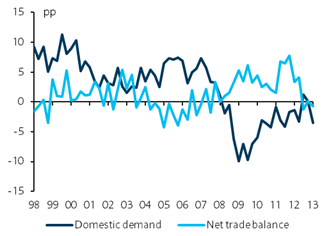 Ireland's trade balance turned negative again and does not seem to be recovering. Furthermore, domestic demand is now weakening. As a result Ireland's GDP contracted and the nation followed the rest of the Eurozone into a recession - just over 3 years after the Great Recession. Given Ireland's high government debt to GDP ratio (Ireland ranks third in the Eurozone after Greece and Italy), this is bad news. The hope was that the government can manage down its leverage as the GDP grows, but that's not how things turned out. Unlike most of the other Eurozone nations whose debt to GDP trajectory was much more gradual, Ireland's ratio shot up rapidly in a matter of 4 years. What makes Ireland somewhat unique in the Eurozone is that this debt spike is directly related to Ireland's bank bailout. The sad part is that Ireland's EU "friends" had a great deal to do with this. Here is why. In the last couple of days the EU reached an agreement on dealing with failed banks. The Express: - The European Union has today agreed to force investors and wealthy savers to share the costs of future bank failures, moving closer to drawing a line under years of taxpayer-funded bailouts that have prompted public outrage. After seven hours of late-night talks, finance ministers from the bloc's 27 countries emerged with a blueprint to close or salvage banks in trouble. The plan stipulates that shareholders, bondholders and depositors with more than 100,000 euros should share the burden of saving a bank. If Ireland were allowed to implement anything resembling this provision during the financial crisis, its debt to GDP would never have reached anything close to the current levels. During the financial crisis a great deal of the unsecured debt of Irish banks was held by the UK's and the Eurozone's banks. And neither the EU nor the ECB wanted to haircut these bonds. In order to "keep the peace" in the EU banking system, these bonds were not written down, forcing the Irish government to make the bondholders whole. It had no resources to do so and was forced to borrow tremendous amounts in order to cover these obligations. As losses on property portfolios inherited by the government mounted, so did the government debt (government guarantee had to cover increasingly larger losses). The austerity drive generated by this high government debt caused unemployment to spike and destroyed domestic demand. It may be a decade or longer before the nation fully recovers. Now that Ireland had paid the high price for covering its banks' obligations, the EU is about to implement the rules to force haircuts on unsecured creditors - something they refused to do for Ireland just a few years ago. The next post will contain an email from a reader describing some of the ugly facts around the bailout of the Irish banking system. The PBoC acted to calm China's interbank markets this morning, somewhat stabilizing liquidity and short-term rates. The PBoC made a vague statement over the weekend regarding its monetary policy. PBoC (translation/paraphrasing): - The PBoC meeting stressed the need to conscientiously implement the Party's recent economic directives, to pay close attention to the latest international and domestic economic and financial developments and changes in international capital flows, to continue to implement prudent monetary policy, and make efforts to enhance policy to be more proactive with targeted, flexible, appropriate and timely fine-tuning. The meeting stressed sound macro-prudential policy framework, the integrated use of various monetary policy tools to strengthen and improve liquidity management, guidance on monetary credit, and steady growth of social financing. These goals should be achieved by maintaining the stability and continuity of macroeconomic policies, while optimizing allocation of financial resources,... and effectively supporting the restructuring, transformation and upgrading of the economy. This will ultimately help serve the real economy, job growth, and financial risk mitigation. What does this mean? It seems the PBoC has been trying to avoid adding incremental liquidity in order to help facilitate the "restructuring" of the economy, while fine-tuning liquidity when needed. Most central bank watchers would agree that creating a liquidity crunch however is a bizarre way of implementing economic restructuring. Raising short term rates may serve two purposes and China is unlikely to be interested in either. One would be to slow economic growth, which China clearly doesn't need. 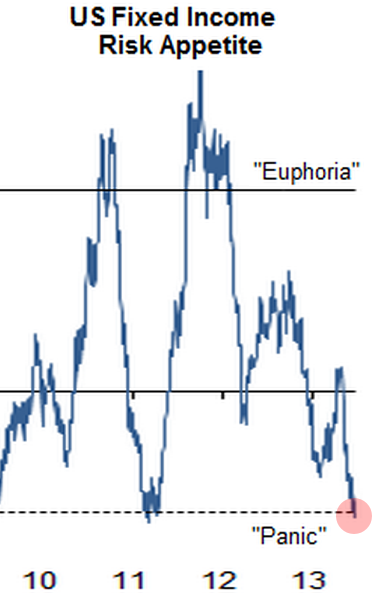 And even if it did, it would want to target a gradual increase, not the mad volatility shown in the chart above. The second reason to raise short-term rates is to defend the currency (something Brazil may end up doing). But China's massive foreign reserves would make that task fairly simple without having to take liquidity out of the market. The central bank is trying to reduce growth in shadow banking and "speculation" using this blunt monetary tool. That will end up tightening credit conditions for regular bank lending as well (see discussion). A far more efficient way of achieving this goal is by increasing bank capital requirements for "wealth management products" as well as on- and off-balance sheet undesirable risk taking. A simple way to implement such policy would be through stress testing requirements, forcing banks to have higher capital ratios. That would reduce unwanted risk taking without killing general lending. But that's not what the PBoC is doing. What this tells us is that China doesn't have a good handle on risk-based capital needs for the nation's banks and resorts to liquidity "starvation" to stem growth in shadow banking. Somewhat surprisingly, Mark Mobius believes the PBoC is doing the right thing. His view is that since the banking system is state-owned, it can be recapitalized (bailed out) at any time. Let the PBoC shock the system and see how things ultimately shake out. CNBC: - While China's housing market problems are similar in scale to those faced during the U.S. subprime mortgage bubble and its banks are rife with bad loans, it won't lead to another Lehman-style crash, Franklin Templeton's Mark Mobius told CNBC on Monday. Sounds like a dangerous strategy. But clearly Mr. Mobius knows best and it is all going to work out in the end. Is that why China's stock market tanked 5% overnight? As expected, dividend-focused shares have underperformed in this rising rate environment. 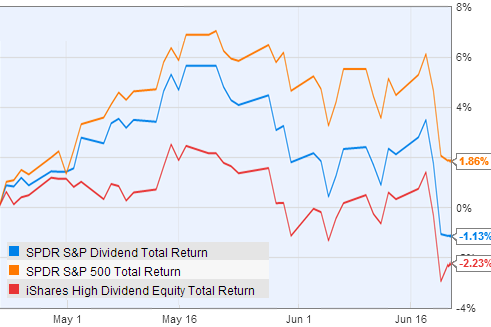 The chart below shows a couple of broad dividend index ETFs vs the S&P500 (SPY) over the past two months. Nevertheless on a year-to-date basis these same shares have performed about as well as the broader market. As discussed late last year (see this post), dividend shares never exhibited signs of a "crowded trade" and therefore were able to withstand this rate adjustment significantly better than fixed income products (see discussion). Mortgage rates spike to two-year high. The refinancing gravy train has ended. China's short-term rates have now spiked to double digits while the PBoC continues to ignore the problem. Reuters: - The weighted-average one-day bond repurchase rate reached 13.1 percent On Thursday morning, the highest level since Reuters' historical data series began. A severe liquidity squeeze has hit China's interbank money market since early June, but the People's Bank of China has declined to aid the market with aggressive fund injections. More media outfits have picked up the story. Numerous theories continue to circulate around the PBoC's rationale for letting the situation worsen. The prime candidate of course is the central bank's desire to tighten the various shadow banking programs and speculative market activities in order to "accelerate reform". There has also been a suggestion that some in the private sector have been trying to repatriate currency into dollars. And by injecting liquidity, the PBoC would suddenly weaken the renminbi, which they want to avoid. Doesn't sound like likely scenario, but worth bringing up. The danger here is that many so-called "wealth management" programs that banks have been running, have longer dated maturities and are funded with short-term money. Tightening the supply of short term money will make it harder to run these programs but will also expose some financial institutions to bankruptcy and even a broader potential panic. This is not substantially different from longer dated structured credit bonds in the US funded by commercial paper (ABCP) or via repo (Lehman for example) in 2007. We all know how that turned out. NY Times: - To some extent, this is fundamentally a Ponzi scheme," Xiao Gang, then the chairman of the Bank of China, wrote in an opinion column in China Daily last October, referring to the mismatch between the maturity of wealth management products and the loans they pay for. 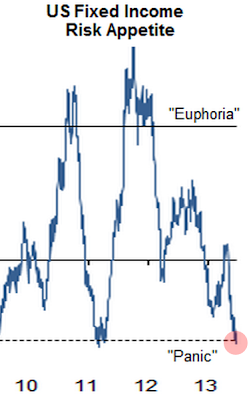 "The music may stop when investors lose confidence and reduce their buying or withdraw" from the products, he wrote. Mr. Xiao now serves as the chairman of the China Securities Regulatory Commission. During periods of booming economy the nation could potentially withstand such a shock to the banking system. But as we learned this morning, China's manufacturing is contracting again. By hitting the shadow banking system, the PBoC is tightening credit across the board - throwing out the baby with the bath water. Let's hope China is prepared for its own version of the Great Recession. "I am a US-based retail investor. I have no positions in emerging markets - why should I care about places like Brazil [discussed here] or China [discussed here]?" 1. BRIC nations have been buyers of massive amounts of US treasuries. As their growth slows down and current account surplus declines, so will their purchases of US treasuries. The other large buyer of US treasuries just announced yesterday that their buying days may be over some time next year. What do you think happens to US interest rates? Mortgage rates? Dividend stock valuations? 2. Take a look at the US exports to BRIC nations over time as percentage to total exports. These nations' economic growth will have a direct and very real effect on US corporations (enjoy your CAT or BA shares while you can), jobs in the US, and the US economy as a whole. So as an American investor, when you see the Indian rupee sell-off to record lows as panicked investors move dollars out of the country (chart below), you should be concerned. Whether you like it or not, you have exposure to emerging markets. It is remarkable that China's central bank has been unable or unwilling to contain the spike in short-term rates, as the interbank liquidity squeeze continues. This is roughly the equivalent of the Fed not being able to control the fed funds rate. You can certainly have fluctuations, but within a couple of days a major central bank should be able to inject enough liquidity into the system to bring down rates - unless of course the central bank wants the rates higher. Something is amiss here. China is risking a recession unless the PBoC can bring this under control. Both the repo and the SHIBOR rates have risen to new highs in the past few days. Some have suggested that the PBoC is in fact trying to tighten liquidity in the financial system in order to put the brakes on the rapidly growing shadow banking sector (see discussion). 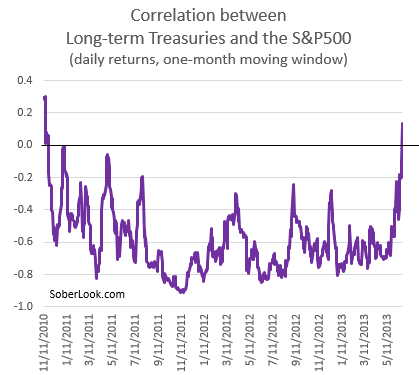 While an admirable goal, creating a liquidity squeeze in the banking system and sending short term rates to multi-year highs is NOT the way to achieve that. This is especially scary in the face of an already "moderating" economic growth. Reuters: - China's short-term funding costs surged on Wednesday, with the benchmark money market rate hitting a multi-year high, and authorities postponed the market's close by 30 minutes to give banks extra time to complete their borrowing. The money market squeeze that began early this month has worsened this week, forcing banks and other financial institutions to trim non-essential businesses, such as wealth management and arbitrage, traders said. That response may be welcomed by the central bank, which has adopted a hawkish stance towards market liquidity since May, partly to clamp down on an increase in risky shadow banking activities, traders said. The interbank market decided to extend the trading time to 5 pm as many banks failed to obtain enough short-term money needed for business at the normal closing time of 4:30 pm, traders said. Such trading extensions have occurred several times recently amid the acute squeeze, traders said. "Everybody is disappointed at the central bank's non-action," said a dealer at an Asian bank in Shanghai. It's not clear if people fully appreciate the potential impact of this liquidity squeeze - including folks at the PBoC. This is not a game. These tight conditions and high rates over a longer period can easily derail lending activities across the country while potentially putting a number of financial institutions at risk and sending the economy into a tailspin. With the Eurozone still struggling in the aftermath of the crisis, let's see what a recession in China (12% of world's GDP) can do for global growth. Mr. Bernanke and company may need to go back to the drawing board very soon.